Marc, was this a Wet or Dry kit? How Much HP are you Ramping in? "70HP".......thats what I'm talking about, do you think you will need this same Controller rate, ramp, ect with your Gen2 Kit??? Unless you/people are going to dive into the Head(up-grade valve train), 40..."MAYBE" 50hp(if you want to cross your fingers lol)will be about the MAX on a Gen2. Any information of nitrous flow for various nitrous solenoid duty cycle settings ? E.g. how close is nitrous jet #40 compared to nitrous jet #60 with 50% nitrous duty cycle ? GREAT N2O CHART MARC!! Bravo!!!! Thanks for Posting. petrik i dont think that duty cycle is linear due to the variables, except if the systen is tested back to back..i.e # 40 jet is installed and flow is measured, then #60 jet is installed and measured...both at 50% duty...that test will tell us if there is a difference. The flow will be greater due to the larger office size on the 60. So if I make up 2 plug and play NOS harnesses for gen 2 who can put them to use soon? And if so where would you mount the NOS solenoid so i know where to make connections, and where would you mount a toggle switch? or did i read its going to be activated only by the push of the selector button? greg, i believe that petrik will be activating it by the dsm switch for now..i will be ready to test next week...need a few more mile on the new bike....as for solenoid, can you provide the mating connector for the beta testers to mount it where they want? Just trying to see if any of the code is active yet, i can make up one or two this weekend but would like to see it cycle on my bike to make sure all is good etc prior to shipping. if i dont have to do a toggle switch makes it nice as well. thats fine.....let me know when ready...i will pp you....will you be able to throw the yoshbox female ends in with it for the 6 harnesses that you sent me..(the ones with the males)..i can shoot you a picture...? not sure on specs for a FAST relay, but the ones I have are typical 5 pin bosch style 30amp, have used them before when testing my original 2 step rev limiter and they pulsed fast enough for a 2 step, so I am thinking they should be good. We will see how this operates when starting to test. Alternatively a transistor driver would do it for sure. The other end of pair goes to +12V so its a grounding the green wire. Anyway we will find for sure when starting the testing - relay speed will be possibly the limiting factor and a fault point over the time when running constantly so a power transistor would be preferred. Same schematic will work with the duty cycle control for turbos when we get there. I will put one to use Greg! I'm trying to figure out how to post Pics on here, But my Noid is Mounted under the Tank, on the Frame, same spot as the EVAP Valve is Located. Let me know How much and I will Paypal you the $$$. damm your quick.........i want one please......i will pp if needed..
Ok, Here it is Greg....I think about 12" will do? Pay no attention to the Fuel Noid...at one time I was going to do a Wet Kit. having a hard time telling, is it behind the air box over breather cover or something? Where do you want the relay? From reading some articles I am getting an impression that ss we are controlling nitrous as well as fuel in liquid form, it should mean that duty cycle affects both flows with same linear rate. What I understad is that the jet should be as close to nitrous solenoid as possible. This means that nitrous systems where the jet is integrated to solenoid and then an small black or blue hose to the airbox should work best with duty cycled controller. If a nitrous bar with jets at the airbox far away from the solenoid is used then the line between solenoid and jet acts as a pressure reserve and the duty cycle control will not work. This may also be the reason why some riders have never been able to get the progressive systems to work. So its no nitrous bar folks, just the thin black line to the airbox. Some systems use two or more solenoids for safety. One of the earliest systems is described here. Nx has a nice controller with a lot of good features, very much alike what has been discussed and planner here before reading this. This is how I believe the fuel enrichment could work. Well the current enrichment already works, but the baseline is not calculated correctly - I believe the current table will be way too rich for any decent jet sizes as it almost double she fuel at the high end. Anyway an user can already to tune the fuel down without any problems to test these adjustments. At 100% duty the nitrous jet size will define the needed fuel add according to the table below, plus a couple of points to bring the AFR to a safe 11.5 level. At some point the duty cycle will be too low to anymore open the nitrous jet, below that point e.g. 25% duty cycle the fuel add will be +0% as no nitrous is flowing. This is because the time needed to open the nitrous solenoid takes longer time than what the duty cycle is on. With fuel control we do not have this minimum opening time issue as we are running the injectors with much higher frequency and every % add to the fuelpulse happens more or less in real time. In between these two points, 25%-100% nitrous, 0%-100% fuel the relationship of fuel add and nitrous add is more or less linear as both are flowing in liquid form. 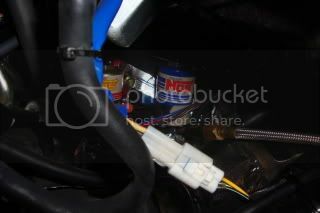 So its no nitrous bar folks, just the thin black line to the airbox. Great Work Petrik! But why No Spray bars? If its a matter of Pulse Rate do to Jetting, one could still install N20 Jet @ Noid, then Plumb to Spray Bar?? The Spray Bar I am currently running is Made by Gixx1300R(he's a N2O Guru on .org & psycho boards), and his Spray bar is Made to run only (1) Jet. So on mine, I could simply move the jet from the 1 into 4 block and install it at the Noid. Maybe I'm not understanding what your saying?? Just a thought, but should we be talking in percent fuel addition or in absolute terms? Lets say we have a stock, 155HP gen 1 busa with stock injectore and spray a 65 shot on it. This represents 42% of the power of the engine. Now factor in larger injectors and or higher fuel pressure....It certainly shouldn't take the same percentage pulse width increase with stock injectors verses 400cc injectors, etc. Since a given nitrous "shot" is a given amount of horsepower, it also requires a given amount of fuel rather then a set percentage of additional fuel. I would guess the whole percentage concept is based on power commanders and the fact that most bikes made roughly the same power. These percentage charts were developed years ago. Maybe it is time for a different approach? I agree marc. It is all relative to the individual bike and tuner preference. Just need a knob to turn. Let the tuner figure out where to put it. petrik,can it be implemented to activate as soon as it is at 90% tps voltage or so without pressing the dsm button as long as the code is active..??? this would give the riders less distraction without worries of having to grip the handlebars and hitting the button....especially for those who are running an air shifter....? This means you will have to hookup laptop to activate / deactivate ? Greg , will a solid state relay not do the job best ? Petrik , my spray bar is a "loop" with 1mm holes above each bellmouth , can I not leave this in place and just move the jet back to the solenoid , I am a bit concerned about distribution with only a pipe. It seems that the adjustablity of fuel / duty cycle will enable any system to be tuned properly. A duty cycly controller will work if the jet is as close as possible to the solenoid. If the jet is at the end of the lines in the bar then there will be pressure build up between the solenoid pulses in to the line (solenoid to jet) and tuinng the beast will be difficult. So nitrous bar:s are good, as long as the stuff from solenoid to bar is travelling in gas form - meaning that the jet is in solenoid and that the openings in the bar are way bigger than the jet. We can implement all or at least most of the stuff requested above and also the ignition retard by gear there - no problems. Lets just only get started with testing and figure out if there are any design flaws in this approach. When we have some testing done then we can start implementing new features. I just dont want to continue building new features all the time before we have had time properly look that everyhing works with the basics. For example the button could be programmed to become activated so that e.g. you can activate for continuous mode while pressing the button and cluch. 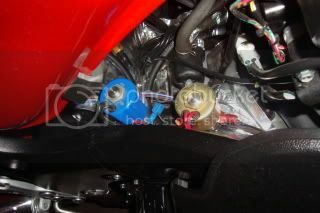 Then the nitrous could be active in rpm & tps window without DSM button. We can also program dsm buttons to provide less/more duty cycle to the engine - but once again, lets get basics working first. After initial tuning by someone setting e.g. a #40 jet and then determining needed fuel amounts for 30,50,80 and 100% duty cycles we can move to use hp or % in the numbers - not before this kind of testing. my opinion is to be active when a mode is displayed on the dashboard if this can be programmed. stocker and toxxic please email me your address to greg@boostbysmith.com so I can build up these beta harnesses today and ship to you tomorrow. Great feature! A built in "Don't let him get around you" button. You have Mail Sir! Thank You Greg! Here you are how depressing the DSM activation button affects the fuelpulse and ignition. First gear1 where no changes and then on gear6 where you can see 100% increase of the fuelpulse and ignition retard.